We learned from the Census Bureau this morning that the decent employment growth in 2014 yielded no improvements in wages and, not surprisingly, no improvement in the median incomes of working-age households or drop in the number of people living in poverty. Wage trends greatly determine how fast incomes at the middle and bottom grow, as well as the overall path of income inequality, as we argued in Raising America’s Pay. This is for the simple reason that most households, including those with low incomes, rely on labor earnings for the vast majority of their income. The Census data show that from 2013–2014, median household income for non-elderly households (those with a head of household younger than 65 years old) decreased 1.3 percent from $61,252 to $60,462. This decrease unfortunately exacerbates the trend of losses incurred during the Great Recession and the losses that prevailed in the prior business cycle from 2000–2007. 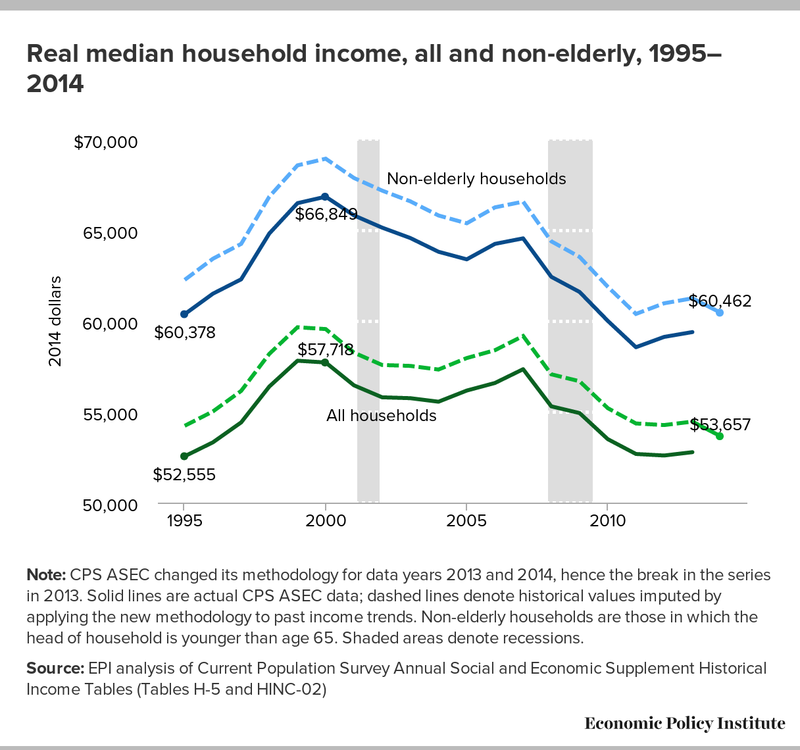 Median household income for non-elderly households in 2014 ($60,462) was 9.2 percent, or $6,113, below its level in 2007. The disappointing trends of the Great Recession and its aftermath come on the heels of the weak labor market from 2000–2007, during which the median income of non-elderly households fell significantly from $68,941 to $66,575, the first time in the post-war period that incomes failed to grow over a business cycle. Altogether, from 2000–2014, the median income for non-elderly households fell from $68,941 to $60,462, a decline of $8,479, or 12.3 percent. Note: CPS ASEC changed its methodology for data years 2013 and 2014, hence the break in the series in 2013. Solid lines are actual CPS ASEC data; dashed lines denote historical values imputed by applying the new methodology to past income trends. Non-elderly households are those in which the head of household is younger than age 65. Shaded areas denote recessions. The key driver of these income trends, besides lower employment and hours in the aftermath of the financial crisis, has been wage stagnation over the last dozen years. In 2014, the median man working full-time, full-year experienced a slight decrease in real earnings of 0.9 percent, from $50,834 to $50,383. On the other hand, the median woman working full-time, full-year saw a slight increase of 0.5 percent, from $39,427 to $39,621. By these measures, real wages have failed to grow since 2007 for either men or women. Looking over a longer horizon, the trends are starkly disappointing. 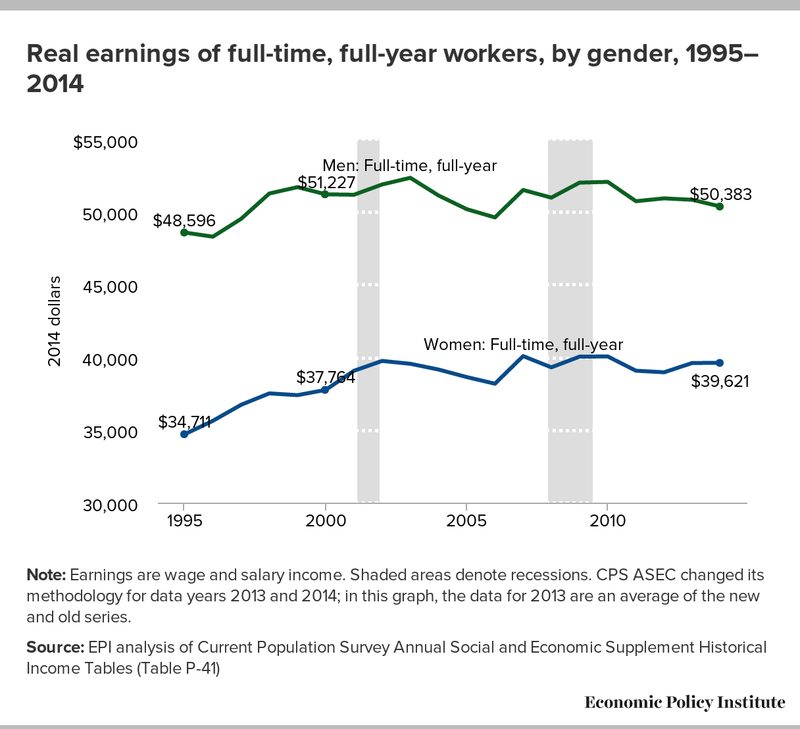 The median woman working full-time, full year saw her earnings grow from $30,180 in 1973 to $39,757 in 2002, and then stagnate in the 2002–2007 recovery and during the recession since 2007, reaching only $39,621 in 2014. Since 1973, the median man working full-time, full-year has seen no sustained growth, dropping from $53,291 in 1973 to $51,902 in 2002 and falling further over the 2002-07 recovery and the recession to $50,383 in 2014. To get household incomes rising we will need to get real wages of the typical man and woman to rise, something that we haven’t seen for more than a decade. Note: Earnings are wage and salary income. Shaded areas denote recessions. CPS ASEC changed its methodology for data years 2013 and 2014; in this graph, the data for 2013 are an average of the new and old series.